Yesterday, I promised you a guided tour of the proposed lien law revisions (HB 489). 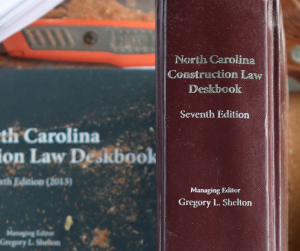 The proposed changes came about through an effort by the Construction Law Section of the North Carolina Bar Association to reach industry consensus on how to improve the current lien law. The council that governs the Construction Law Section voted 11-4 in favor of submitting the proposed revisions to the General Assembly. The proposed revisions are the result of a compromise, and thus many folks will probably find things to like and dislike about the proposal. Moreover, even similarly situated industry participants may disagree on certain points depending upon their customer base, administrative capabilities, and business model. The Section’s proposal started out as as an effort to address the vexing “hidden lien” issue. Hidden liens arise because, under current law, a lien upon real property relates back to the first day labor or materials were furnished to the property. If the date of first furnishing occurs before the sale of the improved property, and the lien claimant files its lien upon real property after the sale, the title insurance company must remove the lien even though the title insurance company had no way of knowing about the lien at the time of closing. When the recession hit, the title insurance industry experienced a dramatic increase in hidden lien claims. In response, the title insurers proposed to eliminate the risk of “hidden” liens by adding a new section 44A-12.2, which states in part that a claim of lien “shall not be effective against real property owned by purchasers…whose interest has been registered…after the date of first furnishing…but prior in time to the filing of the claim of lien.” Under this proposed language, liens not perfected before closing would be wiped out. Naturally, contractors and suppliers vigorously opposed the bill. In an effort to bridge the gap between the construction industry and the title insurers, the Construction Law Section appointed a committee to explore possible solutions to the hidden lien problem. The committee reviewed the lien laws of other states and discussed possible solutions with industry leaders. After many meetings and email discussions, the committee ultimately embraced Florida’s approach of an initial “Notice of Commencement” filed by the owner and a “Notice to Owner” filed by the subcontractor/supplier and served on the owner. On our next stop, I will explain the Notice to Owner and Notice of Commencement in more detail.